Form Description: Do you have a family that is pretty active and athletic? If so, chances are you have more than a few pieces of sports equipment lying around. 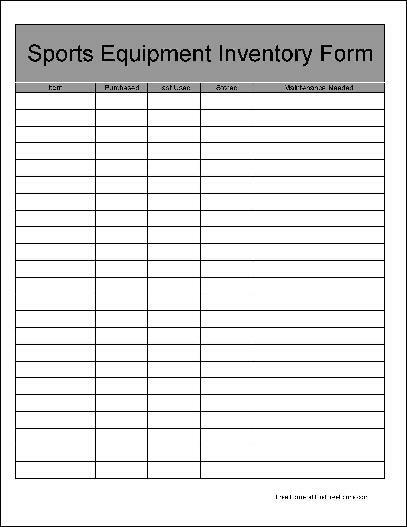 Keep track of those items, where they are located, when they were last used, and the condition that they are in with the help of this Sports Equipment Inventory Form. Definitely a huge help when you have quite a bit of sports equipment that you need to keep track of. With this edition of the Equipment Inventory form you have extra wide rows. These wide rows allow you the easier ability to enter the information in by hand. This can definitely be a huge help when you are filling in the needed information for that vital initial inventory. All in all, it can make a great working copy to use until you are ready for the final version that you will want to print up and look nice and neat. This form ("Wide Row Sports Equipment Inventory Form") is associated with the following keywords: home, family, sports, inventory, tracking, description, log, basic, wide row.